Dress daringly cool with unique designs cut in a charismatic and alluring vision of modern femininity. Asilio began its story in Melbourne with a quintessentially romantic vision from designer Cynthia Farchione. She takes classic shapes and refreshes them through experimental patternmaking and a boudoir approach. Perfect for the progressive modern women, Asilio crafts a story through artistic prints, distinctive colours and textured detailing. Fabricated from flirtatious guipure lace and exquisite necklines, are offset by grand modern shapes and daring cut-out features. Designed for the strong, confident woman, Asilio brings a strikingly diverse selection of low flirty v-necklines, to ornate sheer laces and abstract design lines, will have you looking fresh for an engagement party or race day event. Read our customer Sarah’s story for more ideas on how to wear Asilio to the races. As always, amazing service from GlamCorner. I rented this dress for a summer black tie wedding. Beautifully made dress and the shape/material meant I didn't need a bra. The size 10 fit except it is quite 'booby' for a D cup... i probably would have preferred a size 12. As glam as the pictures suggest! This was my back up dress so I didn't end up wearing it however it was a beautiful dress on, maybe a little long for me as I am a little bit shorter. It’s a great statement dress. The inside slip however was a bit short but that because I’m so tall. 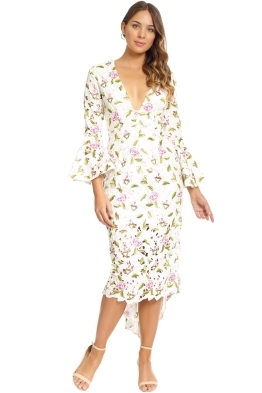 I rented this dress for a friends wedding, it was quite a cold night so I loved having the sleeves. It was slightly tattered in places when closely examined but looked in perfect condition when on!